Every now and then we hear the word Covenant. In Spanish, generally when a couple thinks about celebrating their marriage, they start looking for wedding rings (called alianzas [covenant rings] in Spanish), to seal and signify their lasting love, their unending fidelity, their perpetual union, united for life. In the Bible, God reveals himself as the God of the Covenant. He seeks friends, children, a people in covenant. A covenant unites forces, seals promises, signals common goals, among those who vow to help each other. The great powers of this world sign covenants to make themselves stronger. They ally in order to defend themselves, to broaden their influence and conquer new territories. Our Almighty Father, God allies himself with human beings, the poor, the meek, a small people, sinful and weak. His is not a covenant of convenience but rather of love. For the God of the Bible, the covenant is of presence. He wants us close to Him, and at the same time, He wants to be close to us. In Christ, He reveals Himself a Father in love with His children. He cannot live without them. If He has a Son, in Him, He wants us all to be His sons. The Father’s dream is that we are with Him, for we were born of Him, for Him we live, in Him we move and have our being. The mission He entrusts to Jesus is not to lose any of those whom He has entrusted to Him. He wants us all with Him. His Covenant is of Presence. All creation proclaims the presence of the Lord, but we alone are conscious of this revelation. Pope Francis’ Laudato Si’ helps us recover this vocation. We know that we are the Lord’s work. This proclamation increases our faith, which is convincing of its covenant-of-presence-forever. “The Psalms frequently exhort us to praise God the Creator, ‘who spread out the earth on the waters, for his steadfast love endures for ever’ (Ps 136:6). They also invite other creatures to join us in this praise: ‘Praise him, sun and moon, praise him, all you shining stars! Praise him, you highest heavens, and you waters above the heavens! Let them praise the name of the Lord, for he commanded and they were created’ (Ps 148:3-5). We do not only exist by God’s mighty power; we also live with him and beside him. 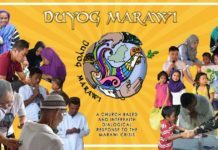 This is why we adore him” (Laudato Si’ 72). The Bible is full of moments and names of Covenant. Noah, Moses, Joshua, the Patriarchs and the Prophets, Mts. Sinai, Shechem, Tabor, the Upper Room, Jerusalem, the Cross, the Eucharist, are signs, persons, witnesses of the God who lives in Covenant, who assures His presence to His friends, His people, with the condition that they confess and live enjoying, celebrating and proclaiming His presence. “When the rainbow appears, I will recall my covenant.” We know that the suspended raindrops function as prism, like glass, breaking light into the seven colors. A beautiful phenomenon of nature after the rain or a storm. All creation is a sign of covenant, of God’s presence. We remember God when the wind gains speed and the storm strengthens. We are all believers when in danger, not so in the calm. Bonanza distracts us from God’s saving, strong and loving presence. We need signs, signs that remind us that God dwelt among us, when everything seemed to kill us. Everything becomes beautiful when the birth of a loved one is announced or we are reminded of that loved one’s passage through our lives. When there is love, everything speaks, there is presence. Love is the enjoyment of companionship encountered. We will never feel alone again. There is no better news! The joy then is signified by the rings exchanged by the bride and groom to seal their marriage covenant. Forever together and mutually present. Infidelity is a crisis of presence, of identity. Not knowing with whom I am and with whom I have identified. God’s Covenant is His Presence with us and our presence with Him. This God’s work in Mary and in us, His Spirit outpoured, presence and foretaste of the eternal and joyous communion we live beforehand and simultaneously await: “hope does not disappoint, because the love of God has been poured out into our hearts through the holy Spirit that has been given to us. For Christ, while we were still helpless, yet died at the appointed time for the ungodly” (Rom 5:5-6). We need signs that remind us with whom and for whom we are. The crises of God’s people were crises of presence. They were distracted from Him who was always with them. Distractions often cause traffic catastrophes, when we stop looking where we are going and where we are heading. Likewise, in the path of faith and covenants. Being attentive is another way of defining love. Love is not distracted. The lover is concentrated in the beloved. But love must be helped in order to be kept alive and concentrated. That is what traffic signs, lights, colors, aromas and gifts are for. All of this is Our Mother of Perpetual Help, the mother of the seven colors, the Rainbow of Redemption. Her eyes and her colors, her hands and her gestures signify God’s Presence among us. She is a beautiful gift offered by the great gift of the Father to Humanity: Jesus Christ. That is why she is a sign of the covenant. She reminds of the first love, the love that loved us first, the love that never fails, the presence that never absences itself. We find her everywhere. To carry, offer, gift, enthrone her Icon is to fill with signs of the only presence that always saves us, of the love that never fails, of the love of our Father, who so loved the world that He gave His only Son, so that everyone who believes in Him may have eternal life. The rainbow emerges after storms. A small ray of sunlight suffices for the menacing clouds to become the colors of peace. The God that Sacred Scriptures reveal to us is not a merciless hunter, as Nietzsche calls Him; in any case, He is a hunter who has hung his bow and will never hunt after His own creatures. The bow hung in the sky is a sign of eternal peace. 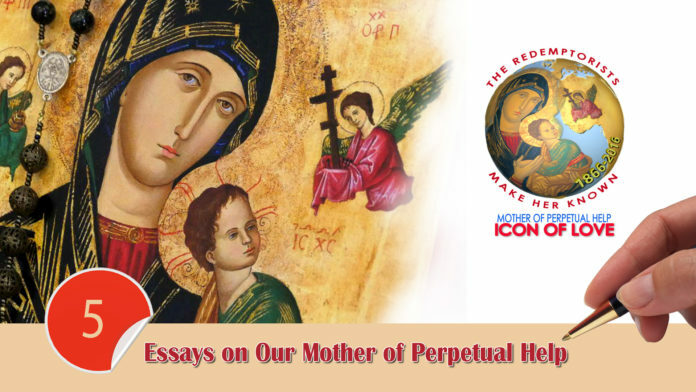 Peace, presence, love, fidelity, companionship and solace, these are the things signified by the presence of the Icon of Our Mother of Perpetual Help. Her colors make her the Rainbow of the Covenant. Her Icon of Love is sign and guarantee of the Presence that never leaves us, of the God who revealed the burning bush to Moses “I AM I AM” which also means “I AM THE ONE WHO IS WITH YOU” (Ex 3:14). It is not about finding the seven colors of the rainbow in the Icon, but rather enjoying her polychrome presence, that leads us to associate her with the rainbow God put up in the sky as a sign of His covenant when he saved Noah and the people from extinction. Pope Francis has invited us to discover all of creation as a sign of the presence of God’s love. Everything in creation is a sign of the great God that never leaves us, who is always present. Mary professed this presence by singing the Magnificat and offering her womb to nurture the Redeemer’s Saving Presence. All she is and has, the project and story in which she takes part, announces that presence. Dressed in heaven (blue) and blood (red), she invites us to participate with her in the glory (gold) she shares with her Son (dressed in green), risen from the earth (brown shawl). He was born on this earth, and like a fertile seed, he rose on the third day, risen from the dead and having had the courage to face suffering and death. (He contemplates the signs of His passion the Archangel Gabriel, dressed in red, presents to Him, as the Archangel Michael completes the instruments of His passion by bringing the spear with sponge soaked in vinegar.) The olive faces with the semblance of nostalgia, are not frightened faces, but rather serene and confident faces. Our skin and our faces change color when we experience emotion and weather. We are what we have lived; we reflect where we live and where we have come from. This is what we see in each of the characters of the Icon of Our Mother of Perpetual Help. Jesus, Mary, Gabriel and Michael are the bearers of that spectrum of colors through which our lives go through, from the here-and-now of suffering to the inexplicable and mysterious beyond. In life’s luminous spectrum, done and undone so many times by the lights and shadows, joys and sadness, Mary and Jesus’ clean gaze emerges. This gaze bears the quietude and hope of those who know where they come from and where they are going (cf. Jn 13:3). They are eyes of light. Contemplating this Icon, so full of love, we are captivated by Mary’s gaze, which follows us, not as someone who scrutinizes us, but as someone who watches over us. 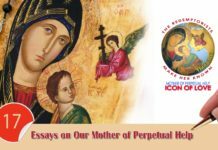 The wide variety of colors captures our attention, and the characters’ movement guide us to the Blessed Fruit: Jesus, center of the announcement of the Icon of Our Mother of Perpetual Help. He is the mature fruit of the Father’s love, the fruit that matured in Mary’s womb. Her red cincture means He is a glorious king and His feet denote the many roads travelled and still to be travelled. He is the green tree that never withers (cf. Hos 14:9), the one which the executioner uses for firewood, when in truth the dry branches, the non-believers, should be the true cause of the sorrow of the women of Jerusalem (cf. Lk 23:31). He is the true Vine, whose pruning bears more fruit, and without Him we cannot do anything (cf. Jn 15:1-5). pray for the Church, whose pure icon you are, that she may never be closed in on herself or lose her passion for establishing God’s kingdom. Jesus’ Good News is the one Mary gives us, the one everyone wants to hear: you will never be alone again – Jesus tells us and Mary announces “I will always be with you.” That is why the Icon of Our Mother of Perpetual Help is a sign of love, of the covenant, of presence and of saved humanity, never again destroyed or denied, because God is with us and Mary guarantees it. She is the new sign, the new rainbow, through whose invocation, the promise of God, for whom we live, is fulfilled (cf. Gen 9:8-17). Blessed are we who by enthroning this Icon of Love, the Polychrome Sign of the Covenant, are rescued, protected and freed from sin, death and destruction. St. Alphonsus reiterates in his Glories of Mary that everyone who takes refuge in her will be saved. Through secret and ingenious paths, she rescues her children whom she never abandons. Blessed are we who take refuge under the mantle and merciful gaze of Our Mother of Perpetual Help! We turn toward her and, with her, present ourselves before God, before life and every brother and sister who, accepting or rejecting us, may need us. Her Perpetual Help encourages and empowers us to become signs of the Covenant the Lord has desired to establish with us and all creation. Joy, color, feasting, the shared table, songs, altruistic service and the testimony of community life will be, as Our Mother of Perpetual Help, the announcement and guarantee of the infinite love Our Father has given us in His Son Jesus Christ: “For God so loved the world that he gave his only Son, so that everyone who believes in him might not perish but might have eternal life. For God did not send his Son into the world to condemn the world, but that the world might be saved through him. Whoever believes in him will not be condemned, but whoever does not believe has already been condemned, because he has not believed in the name of the only Son of God” (Jn 3:16-18). Give us a place in your attentive, generous and tender heart. You are our Perpetual Help! Because He loves us with eternal love. Your boundless goodness is with us always. We carry your Son’s sign in our veins. Marked by the thistles and thorns of the road. We carry in our eyes the sun and the star of the Promise. Thirsty for eternity, we live in your encounter. In the family, in friendship, in work and projects. wherein He wanted to join us to his work. Of the Covenant in eternal embrace. Amen.